We’ve all heard laughter is the best medicine, but four best friends have taken it to the next level with their hidden camera prank reality show Impractical Jokers. Also known as the Tenderloins, the comedy troupe coerces one another into doing public pranks while being filmed by hidden cameras. And the results are hilarious. Not only is the show averaging 2.8 million viewers, but its ranked among the Top 5 programs on truTV and has picked up a diehard following while gaining a ton of media attention. 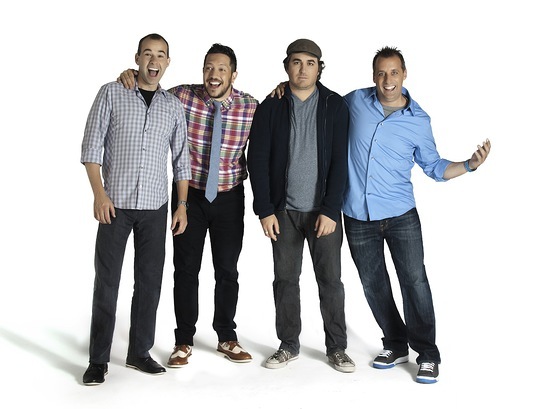 The ‘Impractical Jokers’ are founder Joseph "Joe" Gatto; James “Murr” Murray; Salvatore “Sal” Vulcano; and Brian “Q” Quinn. Look to the Stars was thrilled to speak with “Joe” about his support for Daniels Music Organization, bullying and which celebrity he’d like to prank. Tell us a little bit about your involvement with Daniels Music Organization? How did you become involved? Is there a personal connection? Are you musically inclined? I became a big supporter of Daniel’s Music Foundation after I went to one of their concerts a couple years ago. My sister, who now is their Chief Marketing & Development Director, had done some freelance work with them and asked me to come to the free concert she was emceeing. After seeing the magic on the stage at the concert, I became hooked. The energy and love beaming from every member on that stage is amazing, plus they sound good! So it was a really great experience that pulled at the heartstrings. After, I met the Trush family and Daniel, and fell in love with them. They are an amazing family with an equally amazing story, plus all around great people. After that, I wanted to do everything I could to help these fine people do some good. And the work they do has real impact to people who are often left in the cold. They offer free music lessons to anyone with disabilities in New York. Nowadays, I try to spread the word about this amazing organization so people can take advantage of their awesome program and also assist with fundraising opportunities. As far as musically inclined, the answer is a simple hell no. Do you feel that celebrities have an obligation to ‘give back’? Obligation is the wrong word. I feel like the better word is opportunity. Your reach is increased so you can let people know things that are important or turn them on to causes you feel worthy. You shouldn’t squander the chance you have to make a difference in this world, especially if you can help people’s lives improve in some way. Stand up to bullying. I was bullied when I was younger so it’s a subject that hits close to home for me. People don’t realize the impact and damage it causes. It is so easy to forget that there is a real person being affected by what you’re doing. And the way to stop bullying is to stand up for someone who is the victim. Not by ignoring it. Your favorite prank so far? I really enjoy the sunglasses bit we’ve been doing a couple times. That’s when we are wearing a pair of sunglasses that are blacked out on the inside so you can’t see anything. Then the other guys tell you who to walk in front of and what to say, without knowing who is standing in front of you. After you say it, you have to remove the glasses and deal with the consequences. We made Sal run around shooing what he thought were pigeons, only to take the glasses off and see it was a group of people eating lunch in the park. Any celebrities you’d like to ‘prank’? Definitely. Will Smith comes to mind. I think he’d have a great sense of humor about it and he is a personal hero of mine. Also, Ellen, because I mean, why not? Are you really the most fearless of the four? Yes, one thousand percent. When it comes to doing or saying anything, I have a talent of reading people and knowing what I can get away with, so it helps. “The Good Life” by Kanye West — I feel very fortunate right now, so I think that makes most sense. In case you missed it or need a good dose of laughter, Season 1 DVD (Impractical Jokers: The Complete First Season) will be released on November 26. The DVD will include all 17 episodes from the series’ first season as well as commentary tracks from Q, Sal, Joe and Murr, behind-the-scenes features and deleted scenes. It is currently available for pre-order on Amazon.